The Signet 2537 Flow Sensor is the next generation in fluid measurement technology from the inventor of the original paddlewheel flowmeter. This sensor is an enhancement on what is already an industry standard. It has the added functionality of various output options including flow switch, pulse divider, digital (S3L) or 4 to 20 mA. Additionally, it offers low flow, low power and high resolution and can be configured on-site directly through the built-in user interface. The Signet 8150 Battery Operated Flow Totalizer is compatible with the Signet 515 and 525 flow sensors, and will provide years of dependable operation. The large digital display indicates flow rate and totalized flow volume simultaneously. One of the three totalizers is resettable from the front panel or a remote location, while the second resettable totalizer can only be reset by entering a user-selectable security code. Meanwhile, the third is a permanent non-resettable totalizer. Simple to install with time-honored reliable performance, Signet Model 515 Rotor-X Paddlewheel Flow Sensors are highly repeatable, rugged sensors that offer exceptional value with little or no maintenance. The output signal of the Model 515 is a sinusoidal frequency capable of driving a self-powered flowmeter (Model 5090). The wide dynamic flow range of 0.3 to 6 m/s (1 to 20 ft/s) allows the sensor to measure liquid flow rates in full pipes and can be used in low pressure systems. The Signet Model 515 sensors are offered in a variety of materials for a wide range of pipe sizes and insertion configurations. The many material choices, including PP and PVDF, make this model highly versatile and chemically-compatible to many liquid process solutions. Sensors can be installed in up to DN900 (36 in.) pipes using Signet's comprehensive line of custom fittings. These custom fittings, which include tees, saddles, and weldolets, set the sensor to the proper insertion depth into the process flow. 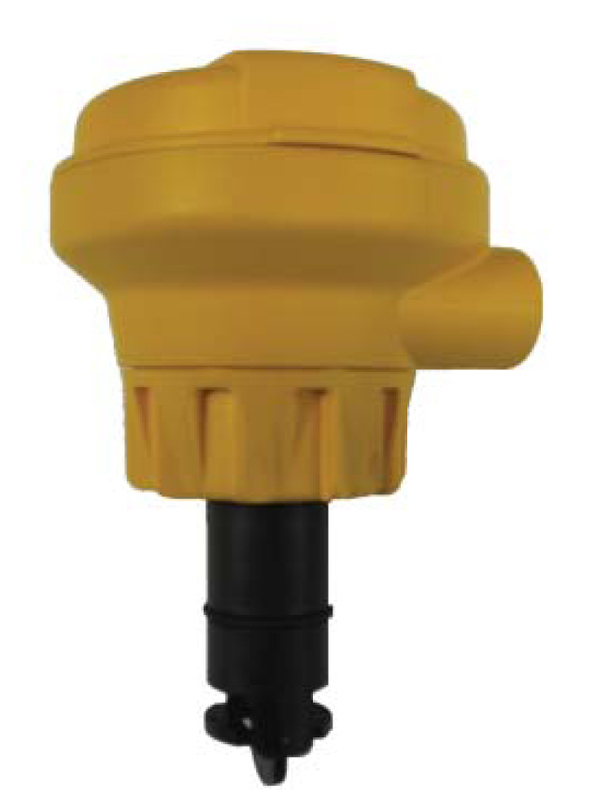 The sensors are also offered in configurations for wet-tap requirements. Paddlewheel flowmeters use the mechanical energy of the fluid to rotate a paddlewheel (just like a riverboat) in the flow stream. Paddles on the rotor are inserted into the flow to transform energy from the flow stream into rotational energy. The rotor shaft spins on bearings. When the fluid moves faster, the paddlewheel spins proportionally faster. Shaft rotation can be sensed mechanically or by detecting the movement of the paddles. Paddle movement is often detected magnetically, with each paddle or embedded piece of metal generating a pulse. When the fluid moves faster, more pulses are generated. The transmitter processes the pulse signal to determine the flow of the fluid. Paddlewheel flowmeters measure the velocity of liquids in pipes, such as chemicals, water and liquids. High accuracy is attainable if carefully installed. These flowmeters are measuring flow at the edge of the flow profile and thus are affected by viscosity changes. The most common use is in a system where the fluid is like water and other variables such as pH/ORP, conductivity, pressure, temperature and level are monitored. All sensors are inserted into the same pipe Ts and connect into one controller/transmitter. There are temperature and pressure limitations of this insertion system but it is very versatile. Applications for paddlewheel flowmeters are found in the water and chemical industries. Water applications include distribution systems. Miscellaneous applications are found in the food and beverage, and chemical industries. Paddlewheel flowmeters are less accurate at low flow rates due to rotor/bearing drag that slows the rotor. Make sure to operate these flowmeters above approximately 5 percent of maximum flow. Paddlewheel flowmeters should not be operated at high velocity because premature bearing wear and/or damage can occur. Be careful when measuring fluids that are non-lubricating because bearing wear can cause the flowmeter become inaccurate and fail. In some applications, sensor replacement may need to be performed routinely and increase maintenance costs. Applications in dirty fluids are not recommended. Easy replacement with insertion magmeters is possible when high failure rates are unacceptable and are often sold by the same vendor. In summary, paddlewheel flowmeters have moving parts that are subject to degradation with time and use. Abrupt transitions from gas flow to liquid flow should be avoided because they can mechanically stress the flowmeter, degrade accuracy, and/or damage the flowmeter. These conditions generally occur when filling the pipe and under slug flow conditions. Two-phase flow conditions can also cause flowmeters to measure inaccurately.